Curing Ichy Tangs without copper I'm sure you have had enough of these questions to last you a lifetime but I had an interesting idea (at least one I thought was interesting). I have a 25 gallon tank (Eclipse 2, with power, chemical and bio filters and protein skimmer) with four hardy fish: 3 damsels, 1 clown. And about 12 lbs of live rock and no inverts. The problem is I have ick that has killed some of my other fish (royal Gramma and Banggai cardinal). My hardy fish catch a little here and there but not enough to cause them harm. 2nd, Move all the fish into a barren treatment tank, just the basic necessities, some PVC or cheap lace rock for 'furniture'. Week 2, be sure to feed your fish, change water, and test chem.s! Week 3-4, place activated carbon in the filtration of the treatment tank. Week 4, start casually raising spg in main tank. Week 7, until you get another fish or other carrier, (and don't follow a good quarantine), you will never see Ich in the main tank again. Multiple Tangs I have a 55 gallon tank with a wet dry system. My favorite fish are Tangs. I have had good luck with my aquariums until I have more than one tang in the tank. 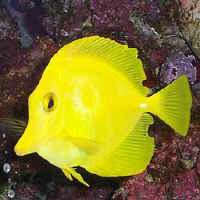 This last time I had a Kole, Powder Brown and Yellow tang. I then had a bad case of Ich which destroyed all but 4 of my fish. I borrowed a high powered UV light and treated with Kent Marine RXP. <A Scam> My Yellow tang is still alive but has rust color markings and frayed fins and tail. Will he be alright and how can I keep a healthy tank with multiple Tangs. I keep a supply of kelps and algae in there for them. I guess I just have to go to Angels or Butterfly fish. Thanks for your answer and your column.